La Petite Gourmess: My Favorite: Greek Yogurt! 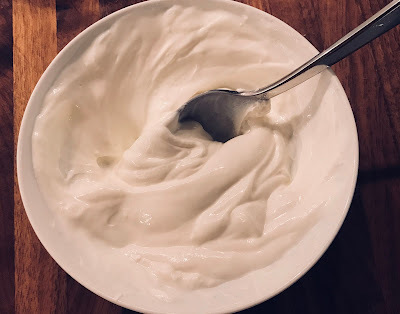 Meet my favorite cooking staple: Greek Yogurt. I like to think of Greek yogurt as "yogurt for grown-ups." Or at least, grown-ups who like to eat lovely things. Just try one spoonful, and I bet you'll be a convert for life. And don't get me started on Labne -- basically the yogurt version of cream cheese. It's to die for. For cooking, the plain full-fat and 2% Greek yogurt versions work well. A bowl of it is a lovely way to start the day, but yogurt isn't just for breakfast -- it's also terrific for lunch, dinner...even dessert. Top plain, vanilla, or honey Greek yogurt with sliced bananas, berries, a drizzle of honey, pinch of cinnamon, and a tablespoon of chopped almonds, walnuts or pecans for a morning treat that will keep you satisfied until lunch. Brighten your morning routine: stir in a handful of blueberries, raspberries and/or sliced peaches and few leaves of fresh mint (minced) into plain, vanilla, or honey low-fat Greek yogurt. Grab and Go: Blend 1 cup of frozen berries, 1 frozen banana, 1 cup of orange or pineapple juice, 2 teaspoons of honey, a sprinkle of cinnamon and about 11/2 cups of nonfat plain (or vanilla) Greek yogurt for a healthy, tasty smoothie. Use plain Greek yogurt instead of sour cream to top your famous chili, baked potatoes, tacos, enchiladas, goulash and more. Stir a dollop of plain yogurt into stews, soups and sauces for a tart, creamy finish. You can substitute Greek yogurt for heavy cream or milk -- just stir it in at the end (off the heat) so it doesn't curdle. Replace sour cream with plain low-fat or nonfat Greek yogurt in your favorite dips. Labne is even better. Ditch the mayo in your tuna, chicken, egg, potato and macaroni salad recipes. Try it with plain low-fat Greek yogurt instead. Just add an extra pinch of seasonings to balance it out. Make your own salad dressings? Try plain Greek yogurt in your next batch of Caesar or Ranch. Or try this: Top a salad of greens, pecans, sliced grapes, and cubed chicken breast with a mixture of a couple teaspoons of fresh lemon juice, a few tablespoons of plain, nonfat Greek yogurt, a pinch of salt, black pepper and fresh tarragon. Reduce the amount of butter in your favorite cookie recipes by cutting the amount of butter in half and replacing about a quarter of the original portion of the butter with plain full-fat or low-fat Greek yogurt. For example, if your recipe calls for 1 cup butter, change that to 1/2 cup butter and then add 1/4 cup of yogurt. If you must use boxed cake or muffin mixes (sigh), omit the eggs and oil and use plain yogurt and water instead, 1 cup each. Mix 1-2 teaspoons of honey and 1 TBS of chopped crystallized ginger with 1 cup of low-fat plain or vanilla Greek yogurt and use in place of whipped cream on top of your favorite gingerbread or pound cake recipes. Top shortcakes with a dollop of low-fat plain, strawberry, or vanilla Greek yogurt mixed with macerated strawberries.